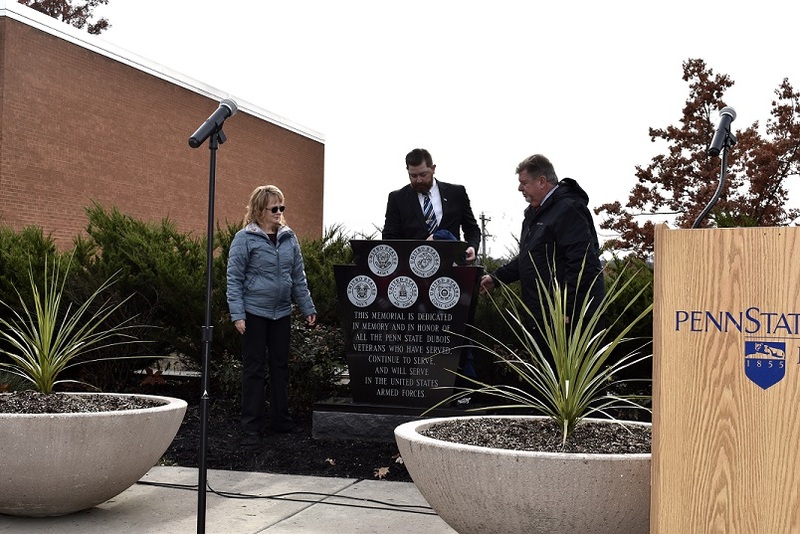 DUBOIS – A monument honoring all students, past, present and future who serve or have served in the armed forces was dedicated during a Veterans Day Ceremony on Monday at Penn State DuBois. The granite, keystone-shaped stone features the seals of all five branches of the U.S. military, as well as an inscription memorializing student-veterans of the campus. Club members employed R.D. Brown Memorial of Punxsutawney to create the monument, which stands four-feet high, and three-feet wide. It has been placed between the flag poles flying the U.S. and Pennsylvania flags in Schoch plaza, a central open space on campus. Members of the campus Veterans Club were inspired by similar monuments on other campuses and sought out approval for the installation of one on their own campus. With approval from Chancellor Scott McBride, the club members set out to design the monument, and raise funds through events a like 5K run, as well as donations from the campus and community. “I would personally like thank everyone who helped us along the way and added to our journey,” said Veterans Club President Kenneth Larsen, a student and veteran of the U.S. Marine Corps. Club members asked their club advisor Sueann Doran, an associate in the campus Community and Continuing Education department, as well as McBride, to unveil the monument. McBride said, “Veterans Day is a solemn occasion, a time when we honor those who have served our country in the armed forces, and those who have made the ultimate sacrifice to preserve the freedoms we all enjoy as citizens of this great land. “At Penn State DuBois, we honor and support our veterans each day. We do this by providing these men and women with support services and by offering a welcoming environment in our Adult Student and Veterans Center. “These important support services and surroundings help our veterans forge their journey into civilian life, achieve their educational goals and graduate on to a successful career. In addition to the memorial dedication, a full Veterans Day Ceremony was held, featuring a Three-Volley Salute and playing of Taps by the DuBois American Legion Post 17 Honor Guard. Founding Penn State DuBois Veterans Club president Scott Davis also offered remarks, as did former club member Michael White and current vice president Michael Volosky, who emceed the event. The ceremony was well-attended by students, faculty and staff, as well members of the community. State Rep. Chris Dush was also in attendance. Which global cities have the best and worst reputations in 2015?